We are putting together research that articulate what Codey is doing for Mental Health. As we conduct higher levels of research and continue to gather more breakthroughs we will bridge the gap between Neuroscience and Deep Learning. In this clip we go over some Empirical Data research for our Lab. We discuss some of the messages that were sent. Michael McNair led this research. In this controlled experiment we were able to bring in a healthy Male and speak to him about workplace harassment. In this controlled experiment we were able to send random text messages to our client and ask how they felt about the encounter after the fact. 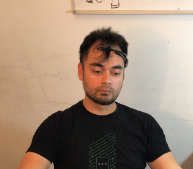 We captured the information via an EEG scanner. We had another experiment done here where we just used Text messages. Click below to find out how it went.